As long as you’re willing to pay the necessary taxes, it’s possible to have almost any kind of vehicle in Japan. While 40% of the vehicles on the road are kei cars with 660cc engines, and most of the remaining 60% are recent Japanese models, in urban environments you’ll see all sorts of awesome vehicles. This Alfa Romeo looks like it ought to be in some kind of 1960s spy movie, With Love, From Tokyo or something like that. Honda City Cabriolet, it’s actually on my MUST OWN WHEN VERY WEALTHY list. Japanese gas stations (this is Eneos, where I usually get my own gas) are serious business. What can you tell me about this Maserati? Mint Green wagon > Brown wagon. Honda Beat in yellow... with yellow wheels... and since it is a personal kei car, a yellow plate, too! Japanese hearses, what do you think? Yes, you can find American sports cars like the Corvette here in Japan. Japan’s retro vehicles are sort of like heaven for fans of whatever the -punk genre is AFTER steampunk. Like 1920s, Gatsby sort of stuff. 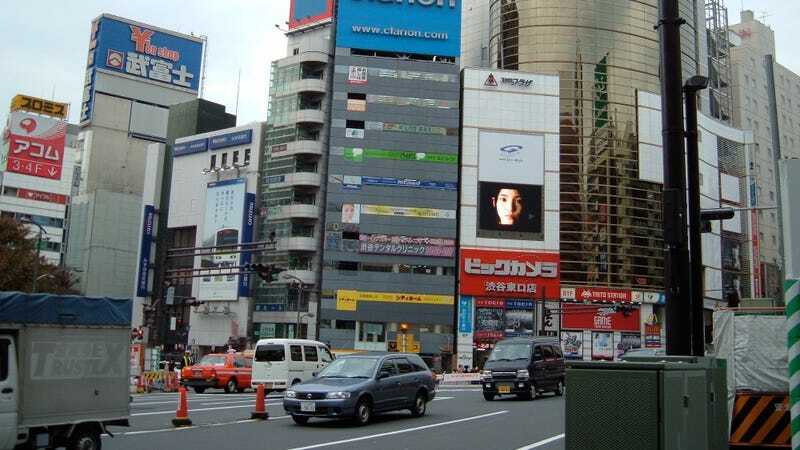 ...while these photos were taken in Tokyo and Kyoto, they honestly represent any sufficiently dense, urban area in Japan. The sheer diversity of vehicles in Japanese urban areas provides significantly more diversity in model and design than I have found living in a few different American states.